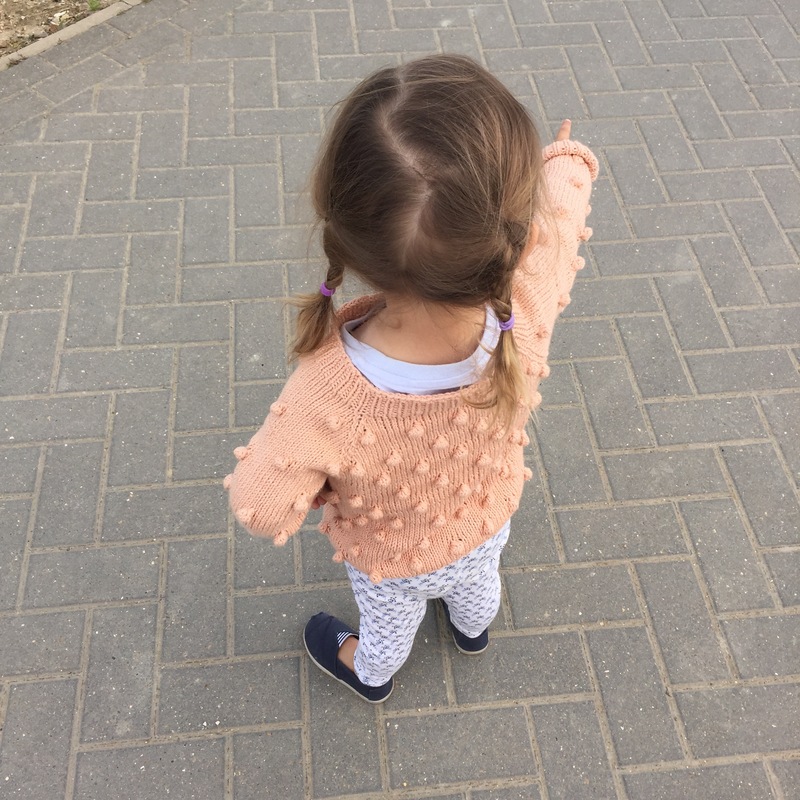 My little girl is at the age where each each new day brings a new word. 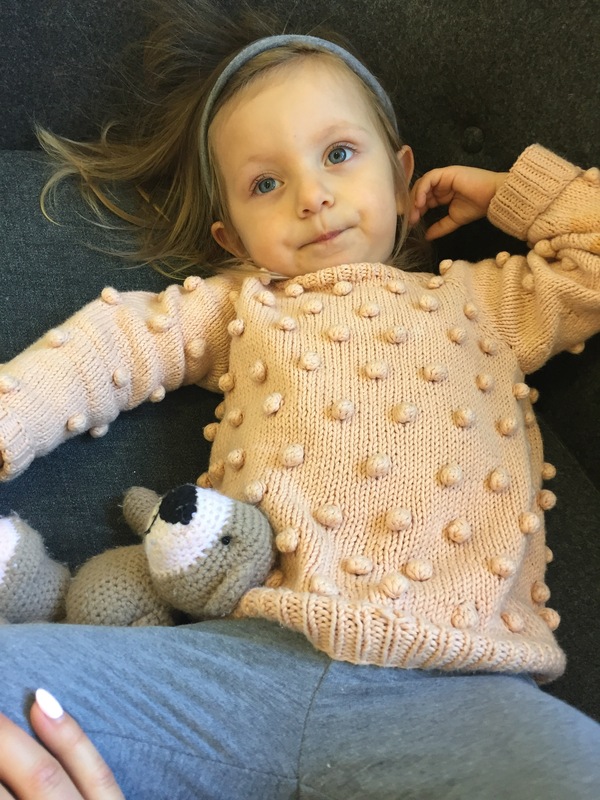 Around about the time I cast on the sleeves for my We Are Knitters Sabrina sweater, she learnt how to say “for me?” and every time I sat down to knit another row she would point at the piece on my lap and repeat her new phrase over and over. 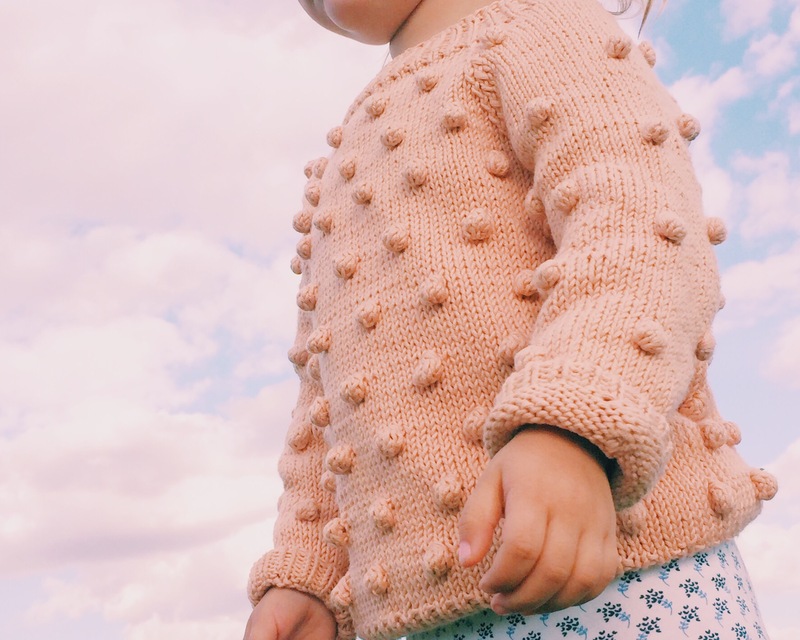 Now, I could have said no but, aside from the fact that she has me wrapped around her little finger and I hate saying no to her, I’d seen what looked like a mini version of the Sabrina sweater being knit up by one of my favourite Instagram accounts/knitting bloggers hellomrsmama and this was a great excuse to order another couple of balls of the We Are Knitters Pima Cotton and attempt what would be my most challenging knit to date. 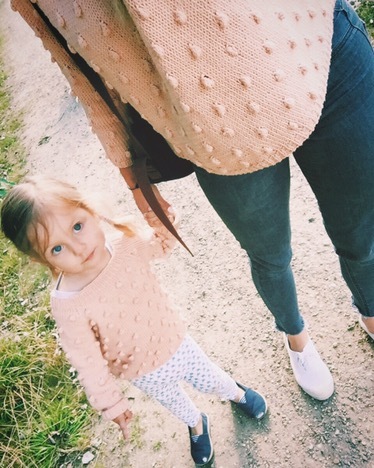 The pattern was the Popcorn Sweater by the Norwegian label Paelas. It is knitted bottom up on circular needles up until you reach the armpits. You then knit the sleeves separately on double pointed needles and the put sleeves and body on the same circular needles and make the specified number of raglan decreases until you achieve the desired opening for the head. Both of my We Are Knitters Jumpers had been knit in flat pieces and seamed together so this tubular way of knitting and joining was new to me. I really hoped it would work because I’m not a big fan of seaming at all! Once I figured out that your circular needles had to be shorter than the diameter of the piece you are knitting (unless you use the magic loop technique which for the life of me I couldn’t figure out) it was pretty straight forward. The instructions are detailed and avoid abbreviations which is really useful for a beginner like me. I knit the bobbles differently to how I had done them with my Sabrina sweater; picking up stitches from the yarn between two stitches rather than by knitting into the front and back loops. Also instead of turning my work to purl back across the picked up stitches I just moved my stitches back onto my left needle, ran my yarn back to the front and knit a second row. I repeated this 3 times and then decreased by knitting two stitches together and casting the remaining stitch off over the top of this one. Because I had created an extra stitch (by picking up the extra bobble stitches between two stitches) I then cast off the stitch closest to the bobble over the bobble stitch. This made the bobble nice and tight and even. I think a video to explain all of that needs to follow! The knitting of the arms on double pointed needles, whilst not difficult, was fiddly and I managed to loose one of the five needles halfway through the first arm, so had to go out and buy another set before I could continue 😒. I now have my eye on a set of circular needles by Addi that are only 20cm long so could be used for arms instead of the double pointers. The trickiest part, as I had expected, was the raglan felling. I say tricky, in fact I just read the pattern wrong and decreased by knitting the two stitches before and after the markers together. The decreases are thereby side to side and don’t have the two lines of parallel slanting stitches you normally see on a knitted raglan seam. It bothers me but not enough to redo it or to take it out of circulation. Finally, the neckband. Urgh, the home stretch and supposedly the easiest part of the jumper and now the part that bothers me the most! Maybe I should have made a few more raglan decreases or gone down a needle size to knit the ribbing or maybe I should simply have cast off tighter. In any case it’s a bit too loose and wide and my fears that it wouldn’t fit over little Vs head were completely unfounded! I knit a wearable bottom up raglan jumper!!! !